Make Your Own Pumpkin Volcano! 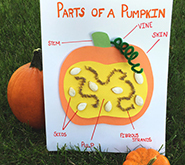 Carve out some time this fall to make a pumpkin volcano with your little ones! 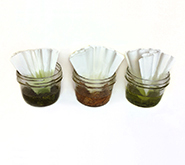 It's a fun, seasonal twist on the classic kitchen science experiment. Pick out a pumpkin or two, stock up on a few basic pantry supplies, and follow us to the kitchen where we'll show you how to make your own erupting pumpkins! 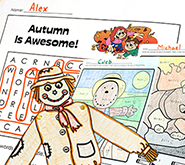 Fun fact: the Super Teacher Worksheets team loves fall, y'all! Around here, you'll hear frequent talk about our favorite apple picking orchards and slow cooker recipes...how our hometown football team is looking this season...and how there are only ___ amount of shopping days left until Christmas! Maybe that's why some of our favorite educational activities, arts and crafts, and science experiments are all about autumn! In this activity, we combined some of the things little ones like best—making discoveries, making messes, and making magical things happen—with things grown-ups like best—meaningful activities that reinforce educational concepts kids are learning in the classroom. Pumpkin volcanoes are a blast—literally! And you'll love the tie to important science concepts too. 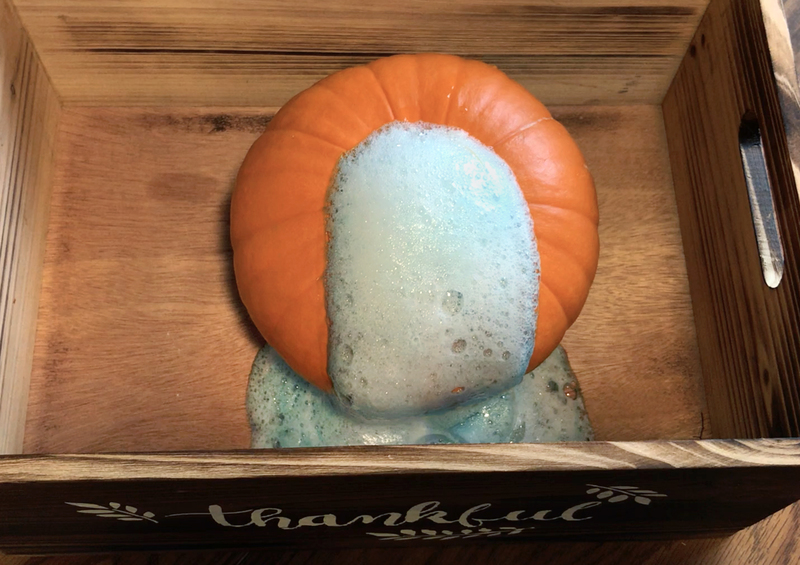 The first thing you'll want to do is set your pumpkin on a tray to help contain the fizzy "lava" eruption. 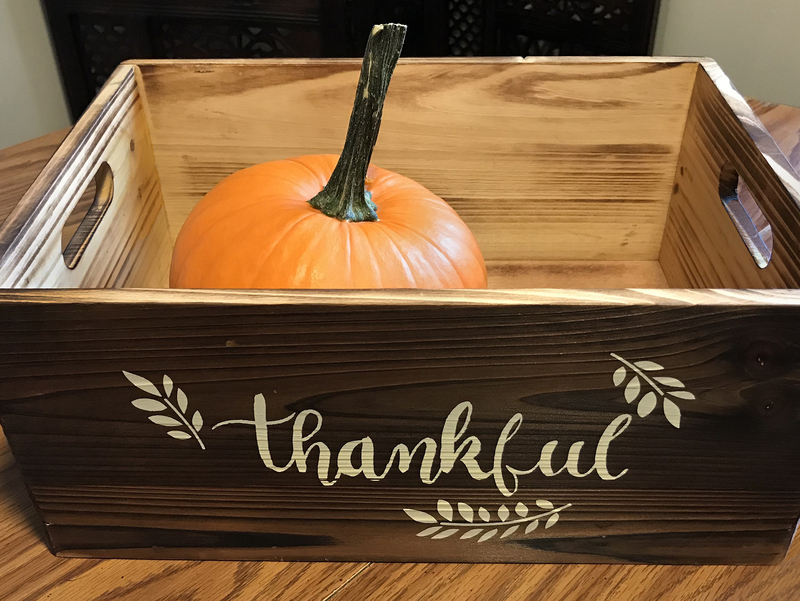 We picked out a festive fall crate from our local craft store. Scoop out all the pulp with a large spoon. 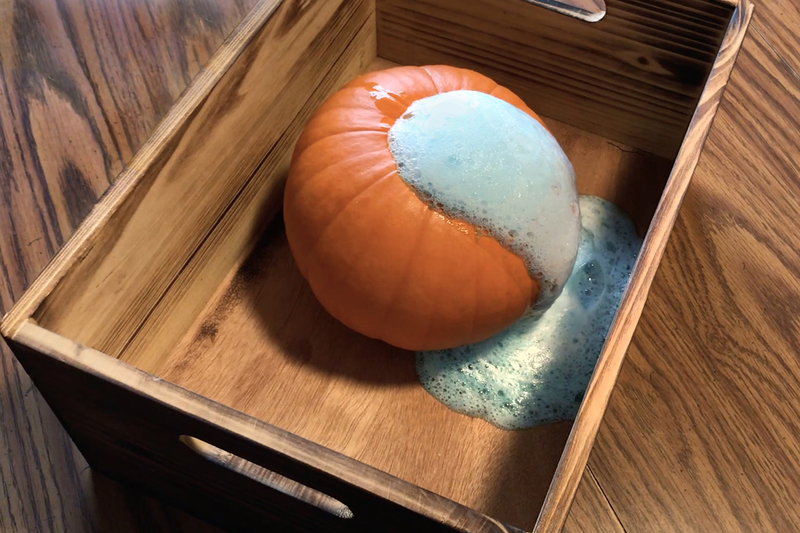 Add two tablespoons of baking soda inside the pumpkin, plus a few drops of your favorite food coloring and a dash or two of dish soap. Now it's time for the exciting stuff! Little by little, add about 1/4 cup of white vinegar to the mixture inside your pumpkin. The baking soda and vinegar will chemically react, producing a frothing eruption that kids will love! 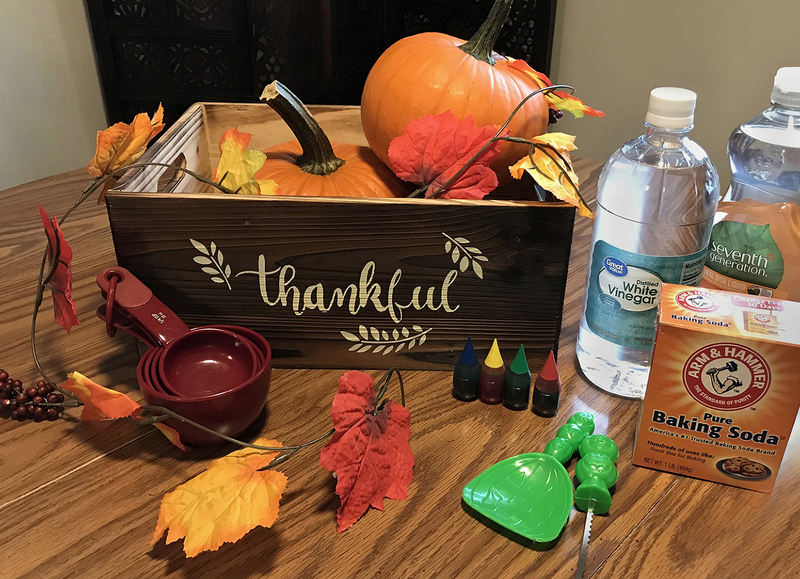 Conclude the science experiment with an explanation of why the pumpkin volcano erupts: the white vinegar, an acid, and the baking soda, a base, react and produce carbon dioxide. 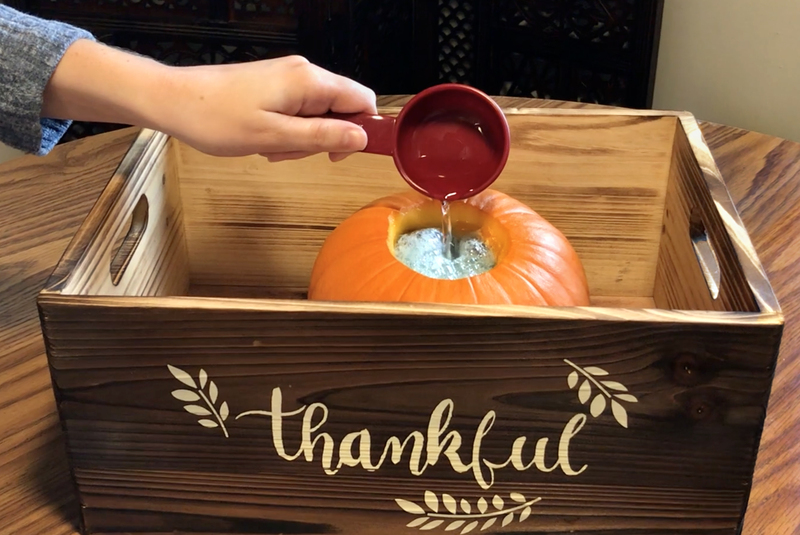 You can empty your pumpkin once it has erupted and repeat the experiment with different colors. You can carve a jack-o-lantern face into your pumpkin for a Halloween twist and watch the lava erupt from the eyes, nose, and mouth. You can replace food coloring with washable paint if you are concerned about the food coloring staining clothing or hands. Now it's your turn! 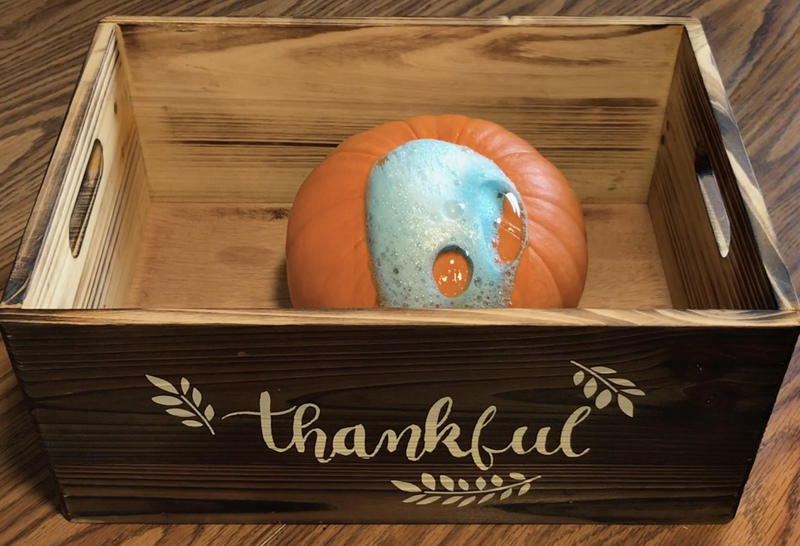 What do you think of this pumpkin volcano activity? 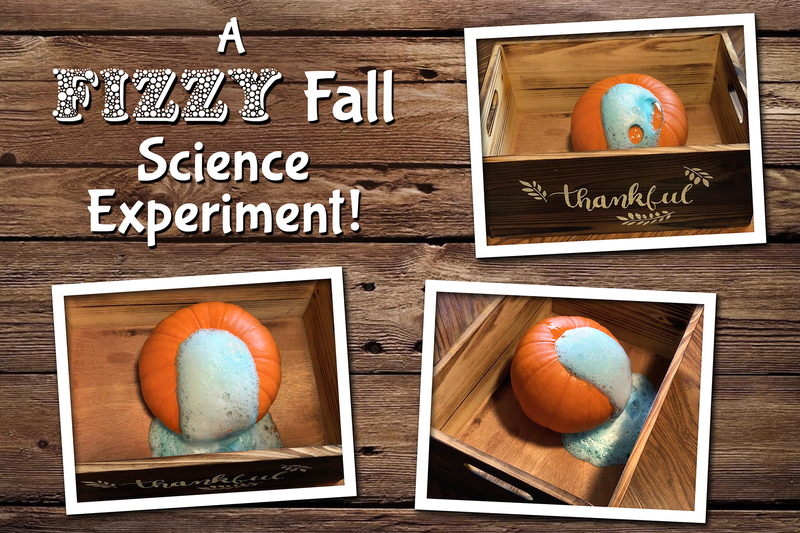 What are some of your favorite autumn activities or seasonal science experiments? Drop us a line in the comments section below! If you're looking for more great fall activities, check out the Super Teacher Worksheets fall activities page!